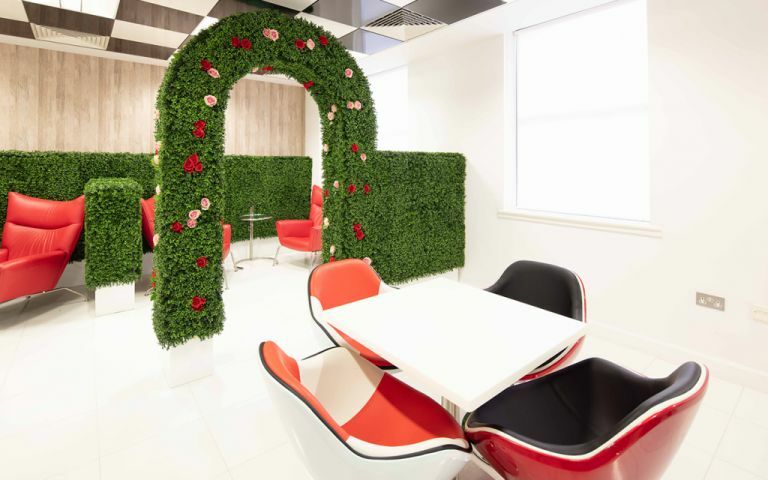 Refurbished serviced offices that have been designed with a Lewis Carroll inspired Alice in Wonderland theme. From the reception desk made of giant books and Alice appearing from a rabbit hole to a meeting room designed on the Mad Hatters Tea Party, this unique building is hard to beat. The first class, unbranded offices offer high speed fibre broadband and all come fully furnished. Clients also benefit from breakout areas, a business lounge and a terrace garden, all of which can be used for informal meetings or for taking a break from your desk. There are nine meeting rooms available to hire as and when you need them, all of which come air conditioned and catering can be arranged depending on your requirements. There is also an onsite cafÃ© for guests to enjoy. Southwark tube station is within walking distance of the offices. Clients will also benefit from the wide choice of eateries within close proximity to the office space as well as recreational space. Modern serviced offices arranged over three floors close to Waterloo station. The warehouse style offices come air conditioned, have wooden floors and are ready to move into immediately. Easy Offices Where is the nearest car park to Boundary Row? Easy Offices Where is the nearest public gym to Boundary Row? Easy Offices Where is the nearest coffee shop to Boundary Row? Easy Offices Where is the nearest place to get lunch near Boundary Row?